Are you having an awesome Halloween party? Well, these beautiful and easy to create favour bags are perfect for you. Make your guests feel special and your party unforgettable. 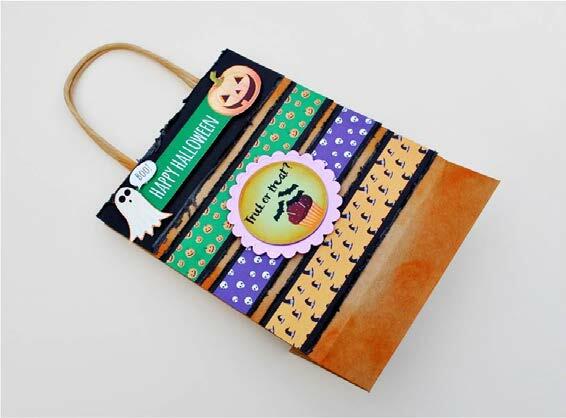 Enjoy the coordinating paper and elements from Crafter’s Inspiration 15 and make these rocking DIY Halloween Party bags! Print the Halloween backgrounds papers and elements from the Crafter’s Inspiration Magazine Issue 15. To create a blended ink border, pick up Carving Pumpkin Distress ink using a sponge or a foam blending tool. Working in circular motions, apply ink to the borders, blending towards the centre as you go. Cut 3 strips of different patterns of background paper of 3cm x 17cm. Layer the strips in matt black cardstock. 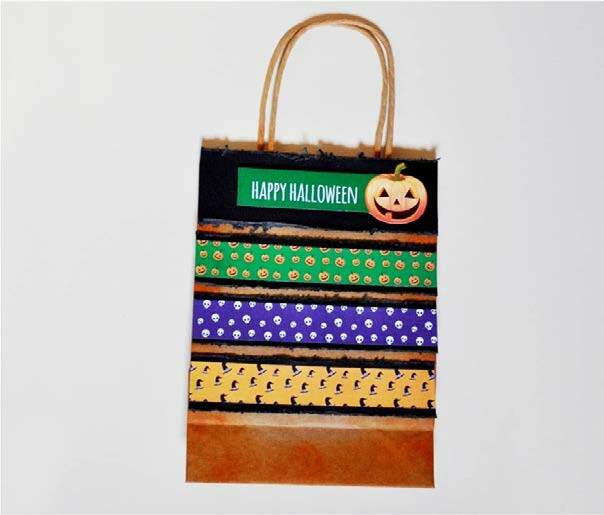 Cut out the “Happy Halloween” sentiment and layer it in matt black cardstock. Run the blade of the scissor along the borders to give it a distress look. Stick the stripes and the banner to the bag top of the bag as shown. 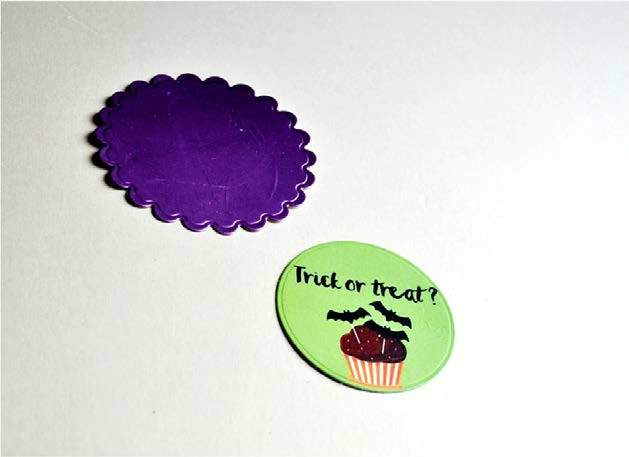 Use the circle die to cut the “Trick or treat?” element. Add foam pads in the back and layer it onto a scalloped circle of purple Centura pearl. 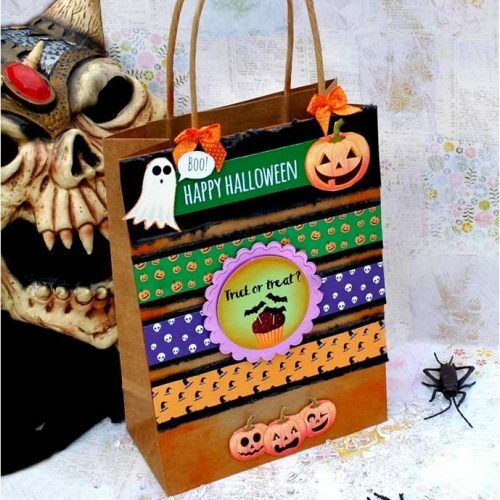 Affix the “Trick or Treat?” to the centre of the bag. Cut out the Ghost and the bubble speech from the papers and attach them to the banner’s top. Cut out the three pumpkins from the CD elements and stick it to the bag’s bottom. Finally, create two little bows with the ribbon and attach them to the bag’s handles. Fill with sweet treats and you are done! Change the look of the bag placing the background strips in diagonal or vertical.